A clone is a cell, group of cells, or organism produced by asexual reproduction that contains genetic information identical to that of the parent cell or organism. Asexual reproduction is the process by which a single parent cell divides to produce two new daughter cells. The daughter cells produced in this way have exactly the same genetic material as that contained in the parent cell. Although some organisms reproduce asexually naturally, the term "cloning" today usually refers to artificial techniques for achieving this result. 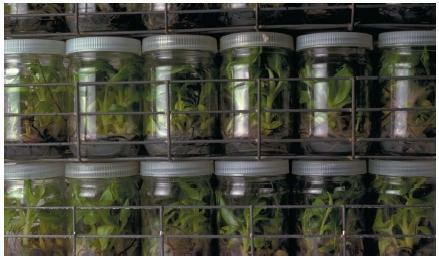 The first cloning experiments conducted by humans involved the growth of plants that developed from grafts and stem cuttings. Modern cloning practices that involve complex laboratory techniques is a relatively recent scientific advance that is at the forefront of modern biology. Among these techniques is the ability to isolate and make copies of (clone) individual genes that direct an organism's development. Cloning has many promising applications in medicine, industry, and basic research. Humans have used simple methods of cloning such as grafting and stem cutting for more than 2,000 years. The modern era of laboratory cloning began in 1958 when the English-American plant physiologist Frederick C. Steward (1904–1993) cloned carrot plants from mature single cells placed in a nutrient culture containing hormones, chemicals that play various and significant roles in the body. DNA (deoxyribonucleic acid): The specific molecules that contain genetic information in an organism. Genes: Specific biological components that carry the instructions for the formation of an organisms and its specific traits, such as eye or hair color. Genetic engineering: The process of combining specific genes to attain desired traits. Genetics: The study of hereditary traits passed on through the genes. Heredity: Characteristics passed on from parents to offspring. Nucleus: Plural is nuclei; the part of the cell that contains most of its genetic material, including chromosomes and DNA. The first cloning of animal cells took place in 1964. In the first step of the experiment, biologist John B. Gurdon first destroyed with ultraviolet light the genetic information stored in a group of unfertilized toad eggs. He then removed the nuclei (the part of an animal cell that contains the genes) from intestinal cells of toad tadpoles and injected them into those eggs. When the eggs were incubated (placed in an environment that promotes growth and development), Gurdon found that 1 to 2 percent of the eggs developed into fertile, adult toads. The first successful cloning of mammals was achieved nearly 20 years later. Scientists in both Switzerland and the United States successfully cloned mice using a method similar to that of Gurdon. However, the Swiss and American methods required one extra step. After the nuclei were taken from the embryos of one type of mouse, they were transferred into the embryos of another type of mouse. The second type of mouse served as a surrogate (substitute) mother that went through the birthing process to create the cloned mice. The cloning of cattle livestock was achieved in 1988 when embryos from prize cows were transplanted to unfertilized cow eggs whose own nuclei had been removed. cell other than the one from which they are taken. Adult cells, they have thought, do not retain the same adaptability. A startling announcement in February 1997 showed the error in this line of reasoning. The Scottish embryologist Ian Wilmut (1945– ) reported that he had cloned an adult mammal for the first time. The product of the experiment was a sheep named Dolly, seven months old at the time of the announcement. In Wilmut's experiment, the nucleus from a normal embryonic cell from an adult sheep was removed. A cell from another adult sheep's mammary gland was then removed and transferred to the empty cell from the first sheep. The embryonic cell began to grow normally and a young sheep (Dolly) was eventually born. 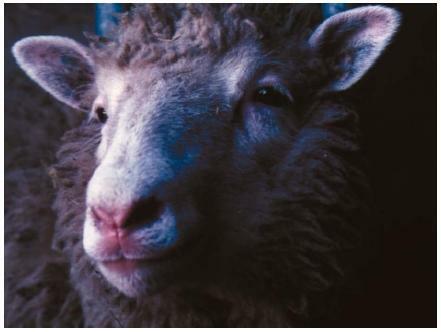 A study of Dolly's genetic make-up has shown that she is identical to the second sheep, the adult female that supplied the genetic material for the experiment. Advances in the cloning process have developed rapidly since Dolly made her debut. Only a year and a half after Dolly was cloned, Ryuzo Yanagimachi, a biologist from the University of Hawaii, announced in July 1998 that he and his research team had made dozens of mouse clones and even cloned some of those that had been first cloned. What made the cloning of adult mice astounding is that mouse embryos develop quickly after fertilization. Scientist had thought a mouse would prove to be difficult or impossible to clone due to its embryonic development. That cloning of dozens of adult mice took place only a little more than a year after Dolly astounded the scientific world. Later in 1998, a team of scientists led by Yukio Tsunoda from Kinki University in Japan announced that they had cloned eight calves from a single cow. Eighty percent of the embryos cloned survived until birth—an excellent efficiency rate. Later, four of the eight calves died from causes unrelated to cloning. In January 2001, scientists in the United States announced they had cloned an endangered species, a baby Asian ox called a gaur (pronounced GOW-er). It was the scientific world's first attempt at replicating an endangered species. Scientists say such cloning could save endangered animals from extinction or even bring back species already extinct. To clone the gaur, the scientists removed the nucleus from a cow's egg cell and replaced it with the nucleus of a gaur skin cell. They then placed the fertilized egg cell in the womb of a domestic cow, which brought the gaur to term. Unfortunately, just 48 hours after the gaur baby was born, it died of dysentery (diarrhea), which the scientists believed was not related to the cloning. Undeterred, the scientists stated they had long-term goals for more endangered species cloning research. Simple organisms are relatively easy to clone. In some cases, entire cells can be inserted into bacteria or a yeast culture that reproduces asexually. As these cultures multiply, so do the cells inserted into them. The cloning of higher animals is generally more difficult. One approach is to remove the nucleus of one cell by means of very delicate instruments and then to insert that nucleus into a second cell. Another method is to divide embryo tissues and insert them into surrogate mothers, where they then develop normally. The cloning of cells promises to produce many benefits in farming, medicine, and basic research. In the realm of farming, the goal is to clone plants that contain specific traits that make them superior to naturally occurring plants. For example, field tests have been conducted using clones of plants whose genes have been altered in the laboratory (by genetic engineering) to produce resistance to insects, viruses, and bacteria. New strains of plants resulting from the cloning of specific traits could also lead to fruits and vegetables with improved nutritional qualities and longer shelf lives, or new strains of plants that can grow in poor soil or even under water. A cloning technique known as twinning could induce livestock to give birth to twins or even triplets, thus reducing the amount of feed needed to produce meat. And as was shown, cloning also holds promise for saving certain rare breeds of animals from extinction. In the realm of medicine and health, gene cloning has been used to produce vaccines and hormones. Cloning techniques have already led to the inexpensive production of the hormone insulin for treating diabetes and of growth hormones for children who do not produce enough hormones for normal growth. The use of monoclonal antibodies in disease treatment and research involves combining two different kinds of cells (such as mouse and human cancer cells) to produce large quantities of specific antibodies. These antibodies are produced by the immune system to fight off disease. When injected into the blood stream, the cloned antibodies seek out and attack disease-causing cells anywhere in the body. The scientific world continues to be amazed by the speed of the development of cloning. Some scientists now suggest that the cloning of humans could occur in the near future. Despite the benefits of cloning and its many promising avenues of research, however, certain ethical questions concerning the possible abuse of cloning have been raised. At the heart of these questions is the idea of humans tampering with life in a way that could harm society, either morally or in a real physical sense. Some people object to cloning because it allows scientists to "act like God" in the manipulation of living organisms. The cloning of Dolly raised the debate over this practice to a whole new level. It has become obvious that the technology for cloning Dolly could also be used to clone humans. A person could choose to make two or ten or a hundred copies of himself or herself by the same techniques used with Dolly. This realization has stirred an active debate about the morality of cloning humans. Some people see benefits from the practice, such as providing a way for parents to produce a new child to replace one dying of a terminal disease. Other people worry about humans taking into their own hands the future of the human race. the unpredictability of cloning in general. While scientists have cloned animals such as sheep, mice, cows, pigs, and goats (and have even made clones of clones on down for six generations), fewer than 3 percent of all those cloning efforts have succeeded. The animal clones that have been produced often have health problems—developmental delays, heart defects, lung problems, and malfunctioning immune systems. Scientists believe the breathtakingly rapid reprogramming in cloning can introduce random errors into a clone's DNA. Those errors have altered individual genes in minor ways, and the genetic defects have led to the development of major medical problems. Some scientists say this should make human cloning out of the question, but others counter that cloning humans may actually be easier and safer than cloning animals. Scientists agree that further research in the field of cloning is needed. i believe that we can use cloning for good with plants and endangered species but i think we woud do the wrong thing by cloning humans. Although the facts of cloning may be amazing , there is still of work to be done to improve the success rate of cloning animals etc. , for example when cloning Dolly the sheep the had over 200 attempts ,and just think of the monstrosities that they had developed with the other 199 attempts. Im doing a project on cloning and I just wanted to say that cloning is a very interesting subect. However most people just dont take the time to learn more about it. I hope to inform more people about cloning wether it be in a negative or positive way and this article has really helped me out. So, thanks. This was excellent!I was just wondering when this was created because I need some recent info..And also if you could please give me more info about cloning..That would be much appreciated! !I really need this info fast so, If you could post some new info ASAP!Thanky you very Much! why is it more difficult to clone an animal than plants? why is it more difficult to clone an mammals than amphibians such as frogs? will you please add more about the process of dna cloning? Cloning is cool but i dont think that we should clone humans because clones could be unstable. One could not say that a clone will be identical to its original parent (as in the original person or animal) due to different exposures and life styles by the two different people or animals another twin paradox. Thanks for the sharing.May people find a moral way to use this technoleghy as soon as possible..